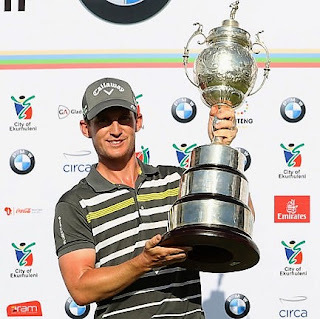 Chris Paisley, 31, from Hexham, made virtually all the running to score his first European Tour win in the South African Open championship hosted by the City of Ekurhuleni. It was his 118th tour appearance. Paisley had scores of 66, 65, 70 and 66 for a 21-under-par total fo 267 - three strokes ahead of South African's Branden Grace (65-71-66-68). As ever in this event, South Africans filled most of the top 10 final placings. The win moved the Englishman up to the fifth in the Race to Dubai rankings after a pay cheque worth 166,000 euros. Victory in Ekurhuleni came in more unusual circumstances with his wife Keri standing in as replacement caddie for the event - the first time she has ever been in the role - as he became the third Englishman to win the tournament in four years following Andy Sullivan's success in 2015 and Graeme Storm last season. Paisley's last win came on the Challenge Tour in July 2012 when he secured a two-stroke success at the English Challenge and he recorded four more top 10 finishes to rank 12th at the end of the season to earn a European Tour card. The Hexham-born golfer has had several near-misses since graduating from the Challenge Tour with third place finishes at the 2015 BMW International Open, 2016 Italian Open and Made In Denmark last season, where he ended the year ranked 112th in the Race to Dubai presented by Rolex after 342,685 euros of prize money. 274 S Vincent (Zimbabwe) 70 66 71 67, J Kruyswijk (SAf) 68 67 71 68, J Blaauw (SAf) 68 70 66 70.